For IL Residents–Please Support Charlotte’s Hospital! We need your help. Please take five minutes to contact the Governor and your state legislators regarding the Children’s Memorial Hospital State Capital request by April 30th. Governor Quinn and the Illinois General Assembly are in the process of developing a capital bill. As you may know, Children’s Memorial has asked the State to contribute $14.4 million to funding the construction of a neonatal intensive care unit in its new hospital, the Ann & Robert H. Lurie Children’s Hospital of Chicago. We respectfully request you to contact your State Representative, your State Senator and the Governor to urge them to include Children’s Memorial’s $14.4 million request in the final capital bill before Thursday, April 30. Please note that we request you click on each link in order to reach both of your representatives and the Governor. To email your Representative and Senator, please click on the following link – http://capwiz.com/childrensmemorial/issues/alert/?alertid=13227351&type=TA. To email Governor Quinn click on the following link – http://capwiz.com/childrensmemorial/issues/alert/?alertid=13227491&type=SW. This will only take 5 minutes of your time. The wondeful folks at the Children’s Memorial Foundation have prepared draft letters and ask you to personalize your message if possible. In early April, I had the distinct honor of attending the dedication of the new cardiac catheterizion lab at Children’s Memorial Hospital. Funds for the new lab were raised by the Children’s Service Board just before I joined the board. If I’m not mistaken, it took about $3 million. While I was not on the board when this gift was made, I was eager to see the new lab as Charlotte has had two cardiac catheterizations. The new lab is inside the operating theater suite, allowing the cardiac interventionists to work even more closely with the surgeons. Because the lab is within the sterile suite, children can move from the lab directly to surgery if necessary and, if a condition proves truly emergent, surgery can occur in the lab. Catheterizations are guided by sonogram and the camera now installed has 360 degree mobility, allowing for much more detailed views of the heart and better diagnosis as well as more precision in determining the success of a procedure. We got to play with the IVs and other tools used for procedures such as closing VSDs, various stents, etc. (We only played with demonstration items–nothing that would be used on a kid!) Closing a VSD used to require open heart surgery; now the doctors can insert the patch via an IV, reducing the invasion into a child’s heart. Dr. Jeffery Gossett, pictured here, delivered a wonderful presentation, then gave us a tour, and guided us through the different tools (or “toys” as he called them), showing us videos of each utensil at work. It was astounding. When we talk about the miracle of modern medicine, I think we really only know part of the story. What Dr. Gossett and his colleagues do on a daily basis takes a steady hand, intense focus, and dedication. It was a privilege to see even a little bit of his world. Since we were all suited up in sterile gear, the nurse who coordinates the operating theaters, gave us the grand tour. I can’t tell you how moving it was to enter the operating room in which my darling girl’s heart has been repaired twice. In case you’re wondering, the new equipment will be moved to the new hospital. To see more and better images of our excellent catheter adventure, click here. To learn more about the Children’s Service Board, please visit Childrensserviceboard.org. SHAMELESS PLUG: To learn more about the new hospital and become a Hero for Life, please visit Heroesforlife.org. Categories: Ann and Robert Lurie Children's Hospital of Chicago, cardiac catheterization, philanthropy | Permalink. First, Aunt Bobbie: Friday night we had Shabbat dinner with Aunt Bobbie, her son (and my cousin) Mark, and our cousin Eric. Charlotte was clearly thrilled to meet her cousins and aunt. I was just delighted to see my family. It had been way to long. We thought Charlotte might be shy with Mark and Eric as she’d only seen one or two pictures and not heard as many stories. She’d spoken to Aunt Bobbie on the phone a few times, so I wasn’t as worried about that. Mark teaches at Boston University in the theatre department and is a founder and the artistic director of TheaterBridge at Brown University. So, we tested his cold-reading skills with Skippyjon Jones in the Doghouse. I’ll be honest, the Skippyjon Jones are tough reads on the first run through, and “in the Doghouse” doesn’t flow as easily as the original. While they are cute, fun, and engaging, this is no Iggy Peck, Architect and it is not for the shy reader. And, after no nap and much excited, his audience was not her usual sit-still for reading listener. I’m proud (and none-too-surprised) to announce that Mark hit all the high points, even making up a melody when the text suggested a song! 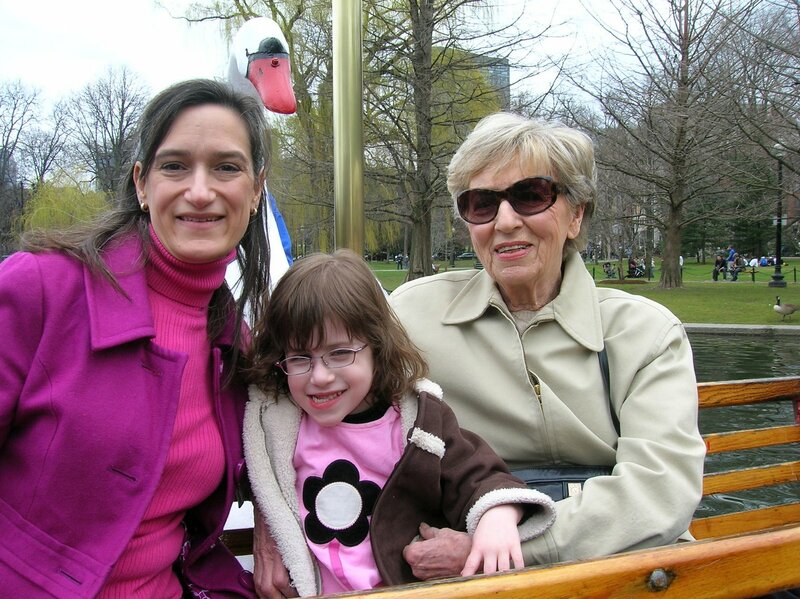 On Saturday we met Aunt Bobbie at the Public Garden in Boston to ride the swan boats and visit the ducklings. What ducklings, you ask? Jack, Kack, Lack, Mack, Nack, Oack and Quack from Robert McCloskey’s Make Way for Ducklings. Now, the aficionados amongst you are counting and shaking your heads. “Eight ducklings, Ilene, eight. You’ve forgotten Pack,” you might be sighing. No, I haven’t forgotten him. He was stolen. While he’s been recovered, he has not yet returned to the gardens. Charlotte acted as a willing stand-in, quacking all the way. After a wonderful morning and lunch with Aunt Bobbie, Charlotte decided not to nap again. We headed to Newton to spend the evening with fellow Brunonians Lisa and Dan Davis and their children Zoey and Marc. Charlotte took to the two big kids immediately and the grown-ups were able to have a lovely visit. So lovely, in fact, that we lost track of time and Charlotte went to bed at 10 p.m. for the second night in a row! And what I mean is, my mommy made it, this adorable skirt, nearly 40 years ago. 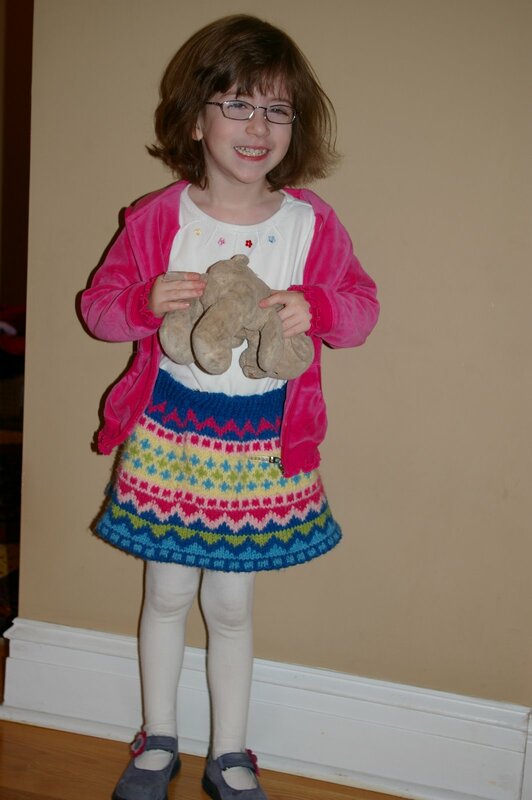 I don’t think hand-me-downs get better than this! Thanks, Mom!